This love story for the ages, set in a reimagined industrial Asia, is a little dark, a bit breathless, and completely compelling. Sixteen-year-old Wen assists her father in his medical clinic, housed in a slaughterhouse staffed by the Noor, men hired as cheap factory labor. Wen often hears the whisper of a ghost in the slaughterhouse, a ghost who grants wishes to those who need them most. And after one of the Noor humiliates Wen, the ghost grants an impulsive wish of hers--brutally. Guilt-ridden, Wen befriends the Noor, including the outspoken leader, a young man named Melik. At the same time, she is lured by the mystery of the ghost. 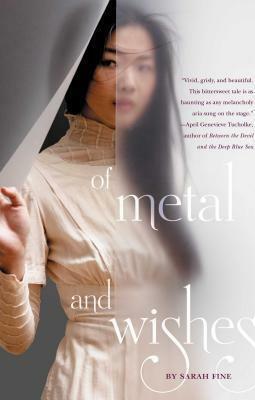 As deadly accidents fuel tensions within the factory, Wen is torn between her growing feelings for Melik, who is enraged at the sadistic factory bosses and the prejudice faced by his people at the hand of Wen's, and her need to appease the ghost, who is determined to protect her against any threat--real or imagined. Will she determine whom to trust before the factory explodes, taking her down with it?